The University of Copenhagen’s Faculty of Science will begin a large-scale elite researcher programme for young international talent this autumn. To improve the career opportunities for the researchers involved, the University of Copenhagen is partnering with the main Danish trade organizations. Together, they will develop a comprehensive solution to attract and retain young international talent so as to meet with the high demand for highly specialized labour in Denmark. Danish companies report a shortage of highly specialised labour, particularly in the STEM fields (Science, Technology, Engineering, Mathematics). As such, the Faculty of Science is working with the country's largest trade organizations to attract and retain top international talent through customized PhD programmes at the University of Copenhagen. The programme begins this autumn. The University of Copenhagen’s Faculty of Science has brought home a large appropriation of DKK 43 million from the EU’s Marie Sklodowska-Curie COFUND programme to subsidize the new initiative. The objective is to attract top-tier student talent from the world’s best universities and give them a chance to launch their careers at the university or with a Danish company. The trade associations involved will help match PhD students with a relevant company to collaborate on topics covered in their dissertation work. In doing so, Danish companies will gain unique access to a large talent pool in areas currently subject to a labour shortage. The scheme also allows companies to freely evaluate PhD students who will be eligible for recruitment upon the completion of their degrees. The recruitment of young, elite international researchers by way of recruitment agencies can often be costly for Danish companies. It also seems to be difficult for international researchers and their families to integrate in Denmark. The collaboration between the University and trade organisations will make the pursuit of a career and life in Denmark both easier and more attractive. “Over the course of their three-year doctoral programmes, we want to help these talented researchers prepare for the Danish labour market upon graduation. By partnering with the Confederation of Danish Industry, the Danish Chamber of Commerce and the Danish Agriculture & Food Council, we believe that we can offer international talent access to educational programmes that could eventuate in attractive careers in Denmark. Danish companies benefit from access to a talent pool that would otherwise be costly and difficult to source. According to the Confederation of Danish Industry, four out of ten Danish companies struggle to find employees, a labour shortage that is expected to continue in the years ahead. Highly skilled international workers help alleviate labour shortages, but Denmark competes globally to attract and retain global talent. The Danish Chamber of Commerce emphasises the need for Danish companies to continue be able to access and recruit international workers. “Companies that compete globally must recruit globally. This is why the Danish Chamber of Commerce has a responsibility to find solutions that facilitate the recruitment and retention of highly specialized foreign labour. Besides the benefits for Danish companies, there is a benefit to Danish society as well,” says Mads Eriksen, head of education and research policy at the Danish Chamber of Commerce. “For many of our members, close collaboration with university environments is critical for exploiting the latest knowledge to help develop competitive new products. Young, international research talents are fantastic bridge builders who transfer cutting edge know-how from universities to companies. Therefore, we really look forward to working with the University of Copenhagen,” says Morten Andersen Linnet, head of research policy at the Danish Agriculture & Food Council. Project acronym: TALENT. The funding amount, 5,807,520 EURO, will co-finance the recruitment of 74 notably talented international PhD students and thereby enhance talent development among young researchers in Denmark. There will be three intake and recruitment rounds. Applicants may not have resided in Denmark for more than 12 months over the past three years. 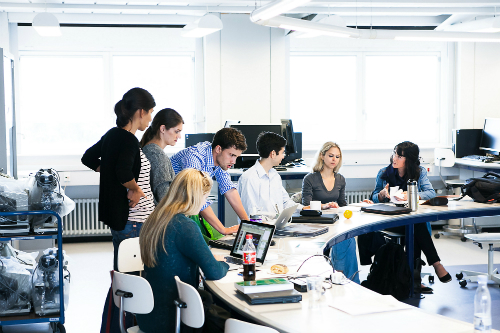 This is an elite research programme in which select PhD students gain access to leading research environments at the University of Copenhagen, special mentoring and state-of-the-art research equipment. They will also gain access to the Danish innovation environments and companies that they find most attractive as future employers.